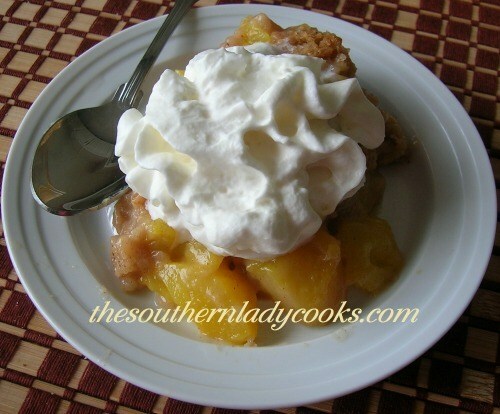 This fresh peach puddin’ is easy, delicious and you will love it with ice cream or whipped cream. Spray 8 x 8 baking dish with cooking spray. Add fresh peaches on the bottom. In a separate bowl combine sugar, salt, flour, baking soda, cinnamon and nutmeg and mix well with wire whisk. Add milk and butter to bowl and continue mixing with a spoon. Spread this evenly over peaches. Bring one cup of water to boil and pour this over the flour mixture. DO NOT MIX THE WATER INTO THE DISH. Bake in preheated 350 degree oven 55 to 60 minutes until top is set. Makes about 10 servings. Serve with ice cream or whipped cream. Enjoy! 0 Response to "FRESH PEACH PUDDIN"